Welcome to the page with the answer to the clue Preserved, possibly. This is just one of the 7 puzzles found on this level. You can make another search to find the answers to the other puzzles, or just go to the homepage of Mystic Words Daily puzzles and then select the date and the puzzle in which you are blocked on. This puzzle was found on Daily pack. 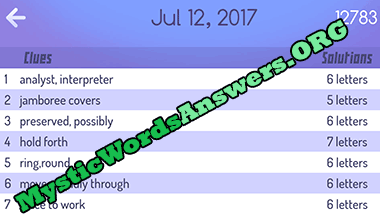 Click to go to the page with all the answers to Mystic words July 12 2017.